With Valentine's/Galentine's season fast approaching, one key question keeps hitting me hard; what would a mermaid want? 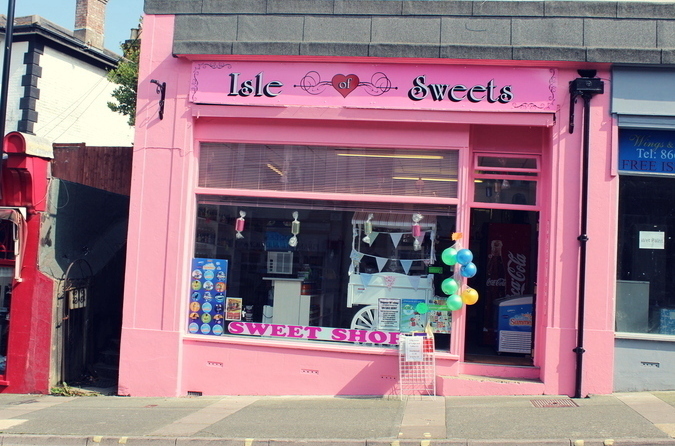 I've been browsing Love the Sales to discover all the stuff mermaids would dream of and have found some transfixing treats to get even the most magical of merbabes totally entranced. For starters, how gorgeous is this ASOS metallic scallop clutch bag? The metallic choker bandeau adds that bit of futuristic fun to proceedings whilst this Missguided metallic denim jacket is just the right side of street to sass things up. I'm also crushing hard on these ASOS space pointed heels, mermaid meets scifi? Sounds like a killer combo to me! 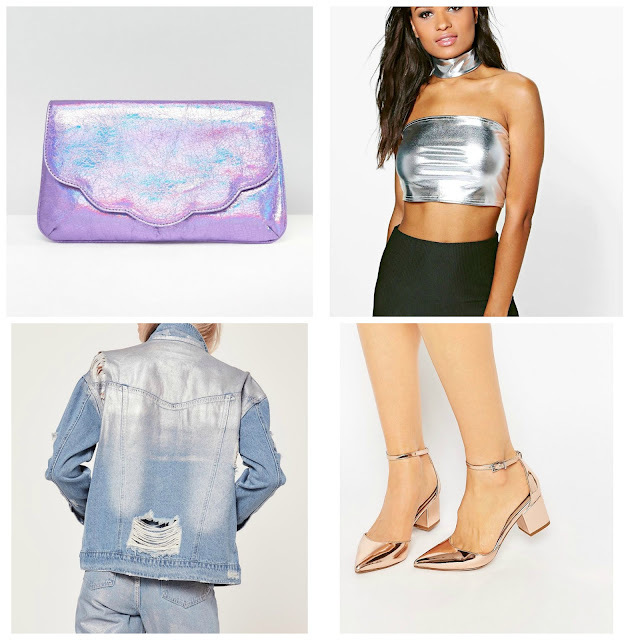 Despite the promise of hearts and flowers, February is still a pretty grey month in terms of temperature, so what better way to jazz it up than with a concoction of metallics, silvers, purples and general mermaid magic? 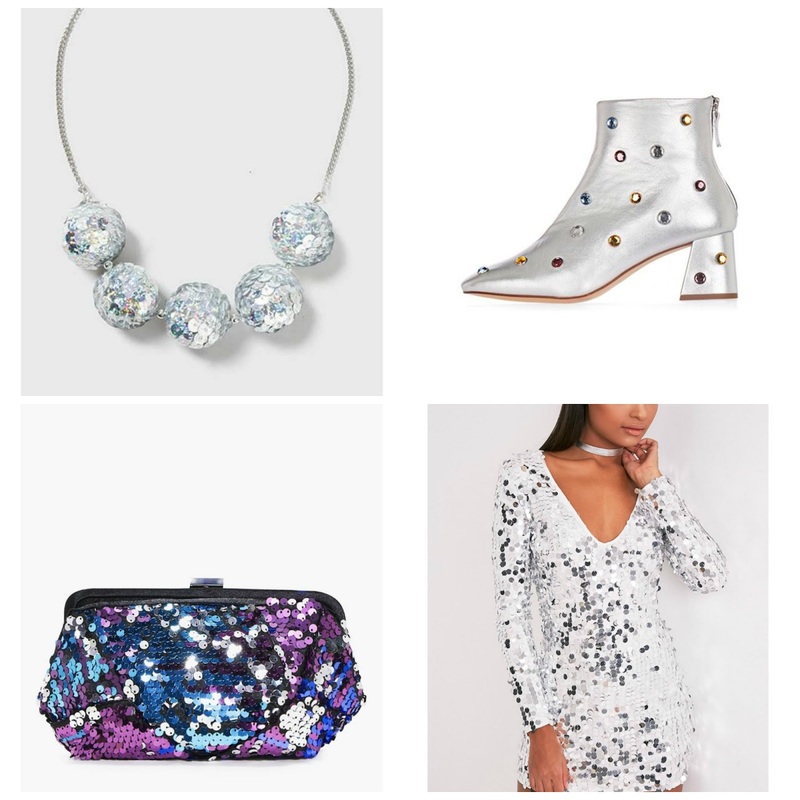 No celebratory season can shine without the aid of disco balls and my eyes were totally OMG-ing when I caught sight of this disco ball dream of a necklace from Topshop. Have you ever seen anything like it? I know I certainly haven't! Colourful rhinestone boots are surely sent straight from cloud nine, and these dreamy studded boots have been magnetised into my mind for longer than I can remember. And of course, the ultimate mermaid fantasy; a kaleidoscope of sequins for you to stash all your shells in, this Boohoo rainbow clutch bag will make you the brightest star on the beach. Last but not least, what can beat a full on glitter glitz of a dress? This silver sequin dress from Pretty Little Thing will be sure to get going the most gorgeous Galentine's to end all Galentine's. Is there anything you're currently coveting? Do you have any Valentine's/Galentine's plans? Ohhh I'm in love with all these gorgeous items on your wishlist! Those ankle boots are to die for, so so pretty! Love your take on Valentine's day, to go for a mermaid llook instead of plain old red! Thank you for sharing all these pretty gems! My fave piece has to be the shell clutch, you can literally imagine Ariel having this if she was a fashionista! I'm literally in love with everything here, that denim jacket is my fave though! Hope you have a fab valentines day my lovely! Oh my Gosh! I have those metallic ASOS heels on my wishlist already. They are fabulous! I can't decide if to do the silver tone or the rose, regardless they will make beautiful accessories. Loving your sweet style Sophie!! Your wish list is dazzling!! Love them all, SO gorg! Hope you and your honey have a great Valentine's Day! I can totally picture you wearing these pieces, Sophie! Sophie I am SO about this treasure trove of metallic goodies! If I could I would add glitter or gold to every outfit, but I don't know how well this would go down in the work place.. Much like a magpie, I am so all over those sci-fi mermaid boots, as well as those gorgeous Topshop ones - there's just something about sparkly shoes that finished an outfit so well; maybe because I feel like Cinderella? 100% can't wait to head to that disco ball, I definitely won't be leaving at midnight!